Parking Receipt scam email delivering Malware. The email claims to be a notification about an unpaid ticket for parking at St Barnabas Street in the City of Westminster. 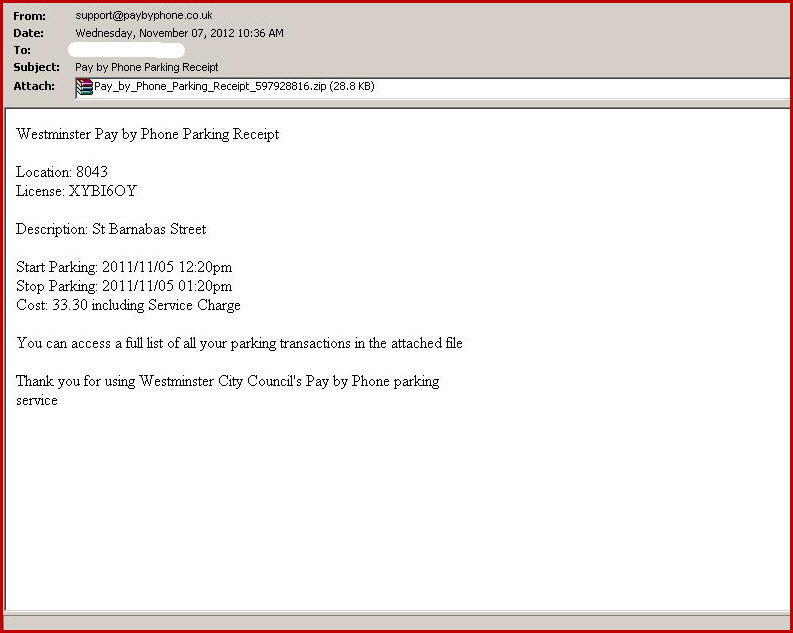 The email is sent from paybyphone.co.uk which is a contractor handling parking fines on behalf of Westminster Council. The subject fields for all emails are the same : “Pay by Phone Parking Receipt” .The emails are an attempt to get recipients to open the attached ZIP file called Pay_by_Phone_Parking_Receipt_#######.zip, which hides a piece of malware inside the ZIP file called ‘Pay_by_Phone_Parking_Receipt.pdf.exe’ and detected by Omniquad’s email filtering solution Mailwall Remote as Win.Trojan.Agent-14031. The cyber-criminals responsible for the attack are probably relying on the fact that although the recipients haven’t been to St. Barnabas Street in Westminster, they might rush to open the attachment after seeing that they have to pay 33.30 (the currency is not specified) for one hour of parking. They will want to investigate, and possibly be keen to prove that a mistake has been made and they have not been there. “Westminster Council’s service development manager, Kieran Fitsall, said: “We received a very high volume of calls in a very short amount of time concerning a spam email that was sent by an unauthorised third party pretending to be our contractor PayByPhone. Omniquad analysts have investigated the origin of these emails, the majority originating from an IP address range belonging to a telecommunications company in Korea. The emails look legitimate, from a legitimate source, and judging by the amount of people who have rang the council, many people may now find that their computer has been infected by a Trojan Horse. It is important to update your anti virus signature and run a full virus sweep of your computer, if you have clicked on the zip file in the email.